This 10 billion X 10 strain per serving baby probiotic is scientifically formulated to relieve the symptoms of colic. Colic is one of the most common gastrointestinal problems infants can suffer. It is now widely acknowledged that probiotics can have a very beneficial effect on an infant’s evolving digestive system as it gradually learns to cope with new foods. • Probiotics may assist in helping promote the build-up of beneficial gut flora. 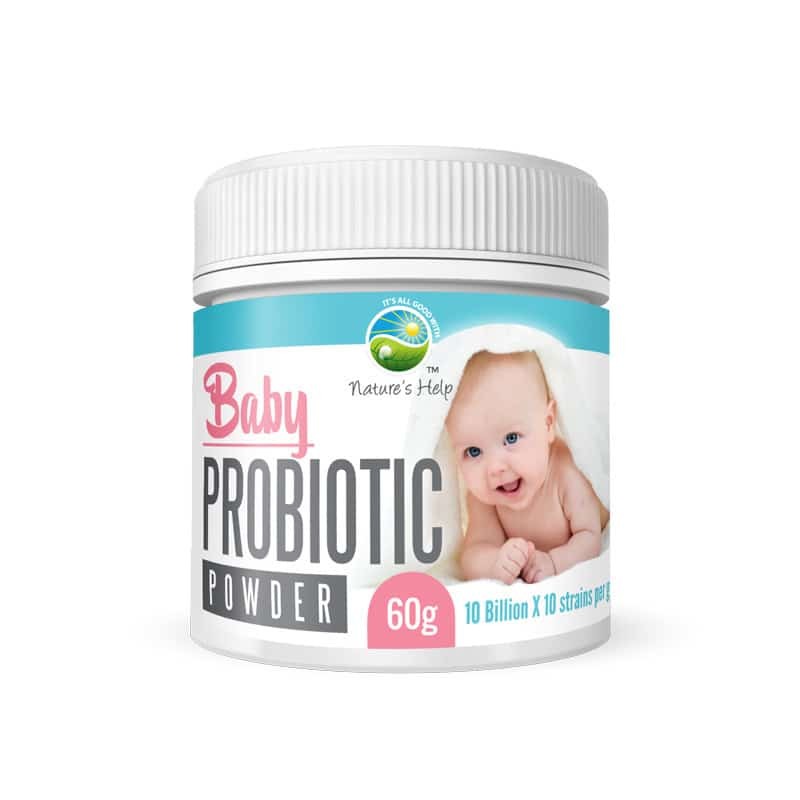 • Nature’s Help Baby Probiotic is also anti-bacterial and anti-fungal and will help to strengthen your baby’s Immune system. • The probiotics advance the health condition in several ways. They make the immune system healthy and more responsive. They also enhance the production of some cytokines such as Interleukin-6 (IL- 6), Interferon gamma, Interleukin-10, Tissue necrosis factor, Interleuken-1 beta. Probiotic strains increase the phagocytic activity of white blood cells called leukocytes. • Probiotics are beneficial in preventing the demise of intestinal tissue and decreases the risk of atopic eczema. It is an allergic condition, occur commonly in infants. • Probiotics plays a vital role in maintaining the health of gastrointestinal tract. Ingredients: Proprietary Ingredient – 10 Billion cfu’s Probiotic Blend per gram Contains:Lactobacillus Strains Bifidobacterium Strains Streptococcus thermophilus Prebiotic – inulin Excipients and flavour Probiotic Strains L. casei, L. gasseri, L. rhamnosus, L. acidophilus, L. plantarum, L. Paracasei, S. thermophilus, Bifido. longum, Bifido. lactis, Bifido. breve. Mix with infant formula in a bottle or baby food immediately prior to serving. While breastfeeding, insert probiotic powder into baby’s cheek, or between front lip and gum prior to feeding. When the powder dissolves in the saliva most of the nutrients are absorbed by the mucous membrane beneath the tongue, taking it straight to where it’s needed. *or as prescribed by your healthcare professional. 0.5gram dosage spoon is included inside the jar.